As of February 2015, Archbishop Joseph W. Tobin’s service for the Church and the Redemptorist order had taken him to a staggering 70 countries. But for all that travel, there was one special place of religious significance he had not visited—the Holy Land. So when Archbishop Tobin set forth on a pilgrimage there with more than 50 Catholics from central and southern Indiana, it was as a pilgrim that he traveled, and not as a guide. Many of his homilies since that pilgrimage have featured meaningful events that made an impact on him, and seven of his weekly “Rejoice in the Lord” columns during Lent and Easter of 2015 reflected upon his journey. While every day of the 11-day pilgrimage provided meaningful, impactful moments, walking and praying along the Via Dolorosa, the “Way of Sorrow,” also known as the Stations of the Cross, in Old City Jerusalem was especially memorable for the archbishop. “Occasionally, a shopkeeper would attempt to sell us something,” he recalled in his March 27 column. “Once or twice, we were scolded—even spit at—for reasons we can only guess. 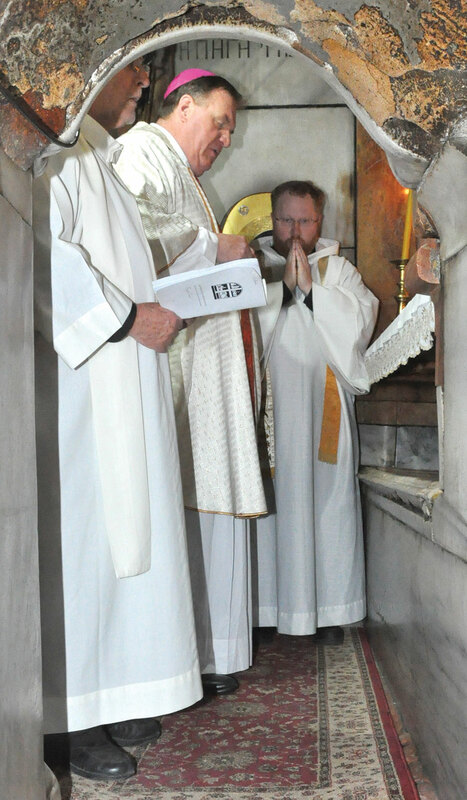 On the last full day of the pilgrimage, Archbishop Tobin had the privilege of celebrating Mass in the Church of the Holy Sepulcher in the chapel over the site believed to be Christ’s tomb. Archbishop Tobin and the pilgrims not only walked in the footsteps of Christ, but also of Christ’s Apostles, particularly St. Peter, the first leader of the Church. He noted in his Feb. 27 column that the pilgrimage took them to important sites in the life of Peter, including Jaffa, the Sea of Galilee, Capernaum and Jerusalem, where Peter denied knowing Christ. In a question-and-answer interview with The Criterion the day after the announcement of his designation as a cardinal in October, Archbishop Tobin mentioned his continuing identification with St. Peter several times, particularly when the Apostle saw Jesus walking during a storm on the waters of the Sea of Galilee—waters the archbishop saw and rode upon during his pilgrimage. “Peter, for reasons that have never been clear to me, blurts out, ‘If it’s you, have me walk on the water’ [Mt 14:28]. 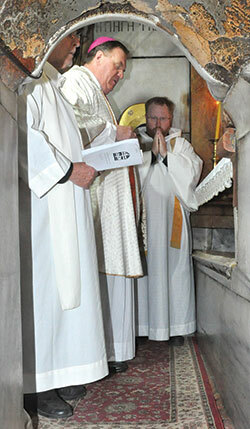 Why didn’t he say, ‘If it’s you, calm the storm?’ ” Archbishop Tobin reflected. “Maybe it was that visceral desire to follow him.